Andrew C. Wallace knows nothing about auto restoration…other than that it’s a great way to go broke over several months/years/decades depending on how long you do it before you throw in the towel. His day job as a low-level film producer is about as far as you can get from anything mechanically related, but is that going to stop him? Heck no! 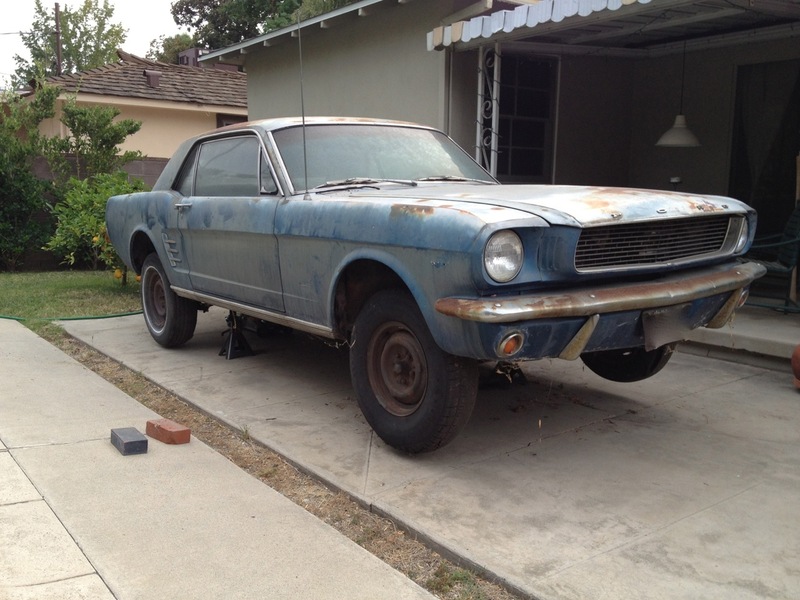 On May 25, 2013, Andrew C. Wallace became the proud owner of a forlorn blue-ish, 1966 Mustang 289 coupe. Nicknamed the “Disgustang” by his friend Alec, the car hasn’t been on the road since 1978, and unlike those barn finds you usually read about, this pony was ridden hard and put away wet. Left out in the open to weather the intervening years rather than being parked in the garage, there’s a lot of surface rust, the interior is shot, the headliner’s falling in, the transmission won’t go into park (so the car rolls no matter where you put the lever), and so on. But with a solid, straight body, a generally less desirable body-style, and an engine that turns freely, it’s a great blank canvas. The goal? To turn this car into a fun daily driver without breaking the bank. Cars are meant to be driven, old cars included. And what better way to enjoy a bit of history than to drive it every day? In February 2016, Andrew and his project won the Mustang Monthly / Tony D. Branda Generation M Contest, which renewed his focus on finishing this project by the end of the year. Stay tuned!